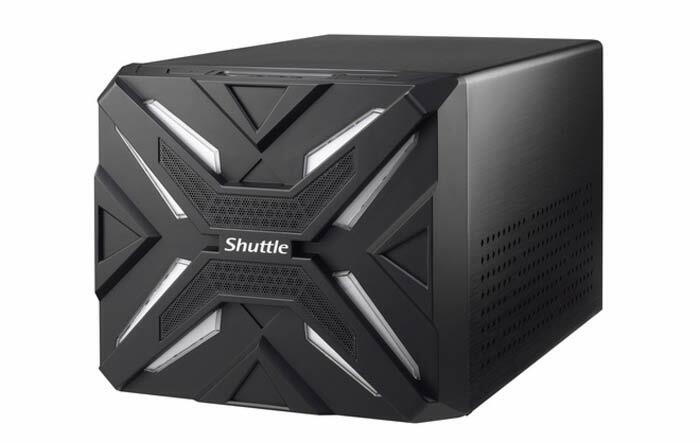 Shuttle has written to HEXUS today to herald the arrival of its “strikingly different” XPC Cube SZ270R9 Mini-PC barebone system. Central to the design of this compact but capable system is an RGB front panel featuring an ‘X’ design and the capacity to handle Intel’s K-series processors (e.g. Core i7-7700K), dual-slot graphics cards (e.g. GTX 1080), and up to 64GB of DDR4 memory, two M.2 SSDs and four 3.5-inch hard disks. Keeping all those components cool calm and collected is a specially designed heatpipe-based cooling system. If you are a Shuttle barebone system watcher you might have already noticed that the Shuttle XPC Cube SZ270R9 is technically identical to the SZ270R8, launched in the previous quarter. The focus of the difference is in presentation, with the RGB LEDs controllable via BIOS and/or management software and the Turbo button which can be configured to get the best clock speeds from your processor (on Intel ‘K’ processors the multiplier gets boosted by a set amount). "The stylised, illuminated X also confidently demonstrates the enormous system power outside the chassis," says Tom Seiffert, Head of Marketing & PR at Shuttle Computer Handels GmbH. "It quickly becomes apparent that the SZ270R9 is a real winner." The pre-installed motherboard in the SZ270R9 utilises the tried-and-tested Intel Z270 chipset for compatibility with socket LGA1151 processors. As mentioned previously it can sport 64GB of DDR4 RAM. For expansion it offers a PCI Express x16 3.0 and one slot with PCI Express x4 3.0. A trio of M.2 slots can accommodate WLAN modules or drives. On the topic of storage this XPC Cube design can fit four 3.5-inch hard disks and two NVMe or Optane SSDs with RAID 0, 1, 5 or 10 modes. If you prefer wired networking, Shuttle’s new barebone has two Gigabit Ethernet ports. 500W PSU is 80 PLUS Silver certified and can easily cope with an Intel Core i7 processor and NVIDIA GeForce GTX 1080 graphics card, says Shuttle. Check through the full hardware tech specs here. If you are interested in this gamer-friendly barebone system Shuttle has released it at an MSRP of EUR 375.00 (excluding VAT). As a barebone you have to leave a significant chunk of your budget for a CPU (+ dedicated GPU for gaming), memory, storage, monitor, input peripherals, and an OS. Shuttle says that specialist retailers throughout Europe will have SZ270R9 stocks from today. What have you done Shuttle?? Their systems used to be so minimalistic but now they have been tempted by the RGB LED Overlords!! Same machine without that stupid plastic face. I know which I'd buy. Looks like someone strapped a cycle helmet to the front. Yuck.